Founded in 1903 out of the remains of the failed Henry Ford Manufacturing Co by Henry M. Leland, the Cadillac company was named after Antoine Cadillac, the founder of Detroit. Leland set about making cars of great excellence, a matter that had been the root of his disagreements with Henry Ford. While Ford believed in manufacture in bulk and selling volume at a low price with a small profit margin, Leland took the opposite view. Leland believed in engineering excellence and that car buyers would recognise and pay for it. As it happened, both were right. Cadillac’s reputation for excellence was quickly established and although Ford introduced mass production it was Leland who was first to standardise components to the point that they were interchangeable. 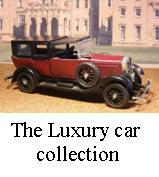 It was Lelands pursuit of quality which contributed to Cadillac being awarded the Dewar Trophy in 1911. This prestigious award was made after two cars had been reduced to their component parts and those parts thoroughly ‘scrambled’. Two cars were then successfully rebuilt from the box of parts, proving that the parts were indeed interchangeable - not something that could be said of other vehicles at the time. Cadillac offered more than 30 different Fleetwood bodies for its 1931 V-16, priced from $5350 to $15,000. Built in the 1970’s this model has been around quite a bit and is now showing it’s age. Made before we branched into the world of washes and detailing it is straight from the box. It is quite a large car even though it is in 1/32nd scale. Brush painted with Humbrol enamels the picture shows a lot of light reflections which confirm it is possible to get a good finish without spraying. The lack of washes and dry brushing show the difference that it makes. This car looks less realistic than our later models. But it is all a matter of taste as you can read in our articles and projects on modelling.